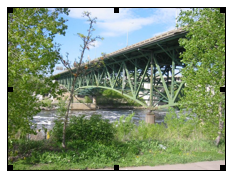 It has been a little over a year since the I-35 Bridge in Minneapolis failed during rush hour traffic on August 1, 2007, collapsing to the river and riverbanks beneath. The bridge, which brought nearly 140,000 passengers across the Mississippi river daily, had been a major route for commuter in the area. 13 lives were lost and nearly a hundred people wounded when the bridge collapsed. Architects and contractors have been specifying our Stainless Steel Spikes and other products on similar projects for years - including the Brooklyn Bridge, and the Golden Gate Bridge. The collapse of the I-35 Bridge caused a countrywide examination into the viability of the nation's bridges. It was discovered that in a 2005 report card issued by the ACSE (American Society of Civil Engineers) roughly one quarter of the nation's 590,750 bridges were "structurally deficient or functionally obsolete". Not long after the bridge collapse we learned that the I-35 Bridge had received poor ratings in earlier inspections. In fact, the Federal Highway Administration had declared the bridge structurally deficient back in 1990. It was reported that bird droppings on the steel trusses could be a contributing factor to the corrosion of the steel. Inspectors began reporting a build up of pigeon droppings two decades before, yet no serious measures had been taken to clean up the feces or install pest bird deterrents to keep the pest pigeons off the bridge. Bruce Donoho owner of Bird-B-Gone, Inc. the largest manufacturer and distributor of bird control deterrents in North America says, "Bird feces are acidic and can be very corrosive to building materials like those used on the I-35 Bridge if not properly removed." Though screens were installed over some of the openings under the bridge to keep birds out, there where many other places that the birds could land and make their mess. It is not clear if the installation of some sort of bird deterrent on the rest of the bridge could have prevented the collapse, but according to Donoho, "It would have made the bridge safer for maintenance crews as bird feces can also carry diseases that can harm people and can carry over 36 transmittable diseases". "I have seen that pigeon feces does corrode metal and building parts," Bruce Donoho, founder of Bird-B-Gone, told Roads & Bridges. "When the story is finally analyzed, it would take many, many, many years and a combination of things to actually have the pigeon feces be the cause. There was probably a situation where it added to it, but pigeon feces alone is not going to bring down a bridge. "I look at it as more of a health issue," he continued. "If anybody is going underneath that bridge to inspect it or maintain it they are going to come in contact with pigeon feces. "The problem with those feces is they usually become very dry, and if you disturb them they will become airborne. It can be a problem with people coming in contact with that. [Feces] can cause at least 36 known diseases." Donoho said he receives many calls from state departments of transportation (DOT), but it usually is because pigeons have become a nuisance to workers and pedestrians walking under a bridge. The replacement of the collapsed I-35W bridge, the St. Anthony Falls Bridge, crosses the Mississippi River at the same location as the original bridge, and carries north-south traffic on Interstate Highway 35W. It was constructed on an accelerated schedule, due to the highway's function as a vital link for carrying commuters and truck freight. St. Anthony Falls (35W) Bridge was opened to the public on September 18, 2008 at 5am. This new bridge will take precautions against the build up of bird feces by installing Bird-B-Gone, Inc. Stainless Steel Birds Spikes. E.S.S. Brothers, Minnesota's largest distributor of castings and other various road construction products contacted Bird-B-Gone, Inc. to find the right product to keep pest birds off the bridge. Donoho says, "We recommended our Stainless Steel Bird Spikes for several reasons. They will keep the pigeons from landing and roosting on the bridge, are virtually invisible so they will blend in well with the architecture of the bridge and they have the longest industry guarantee - 10 years!" 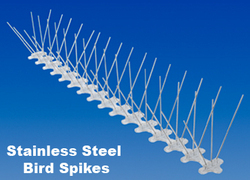 Bird-B-Gone's Stainless Steel Bird Spikes are easy to install, effective and an inexpensive solution to deter pest pigeons. Donoho adds, "Architects and contractors have been specifying our Stainless Steel Spikes and other products on similar projects for years - including the Brooklyn Bridge, and the Golden Gate Bridge." The new I-35 bridge, the St. Anthony Falls Bridge, now has Bird-B-Gone, Inc. Stainless Steel Bird Spikes installed on it. Bird-B-Gone, Inc. is the industry leader in Pest Bird Control since 1992, and the #1 Specified Bird Control Products by Architects, Contractors and Government Agencies in North America. Donoho says, "We are very proud to know that our products are being used on the new 1-35 Bridge, they will help to promote a cleaner, healthier environment under the bridge, and help save in maintenance costs." Bird-B-Gone, Inc. has over one hundred products available to solve pest bird problems including Bird Spikes, Bird Netting, Shock Track Systems and much more. Useful CAD details and Specifications are available at http://www.birdbgone.com or call 1-800-392-6915.